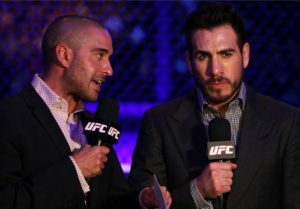 UFC commentator Jon Anik and multi-time title challenger Kenny Florian have partnered with FOX Sports to make their podcast bigger and better going forward. Anik and Florian (14-6 MMA, 12-5 UFC), who fought for a UFC title three times before retiring in May 2012, are a duo who have called numerous UFC shows from cageside, worked together on the analyst desk for FOX Sports properties and are 128 episodes deep into a podcast together, will see their show distributed on a new platform starting today (October 30, 2017). According to a FOX Sports exec, the podcast, which sees new episodes released each Monday, will be enhanced “slowly over the coming weeks, adding video and graphics.” Aspects that have grown the podcast’s popularity will stay in place, such as guest interviews and the “Ray Longo Minute” with noted MMA coach Ray Longo. Although the “Anik & Florian Podcast” has been in existence for more than two years, Anik said now was the right time to strike a deal with a partner like FOX Sports. The biggest change going forward, Anik said, will likely be an expansion into a video format. FOX Sports made a noted pivot to video content earlier this year, and it appears the “Anik & Florian Podcast” could be a part of that vision.